I buy into all propaganda. Everyone that knows me and read that probably just shook their heads knowingly. Target audience for all advertising? Yours truly. A couple of friends were going out for lunch one day in Queens, but I had to decline. Because I had to go get free lip balm in Manhattan. 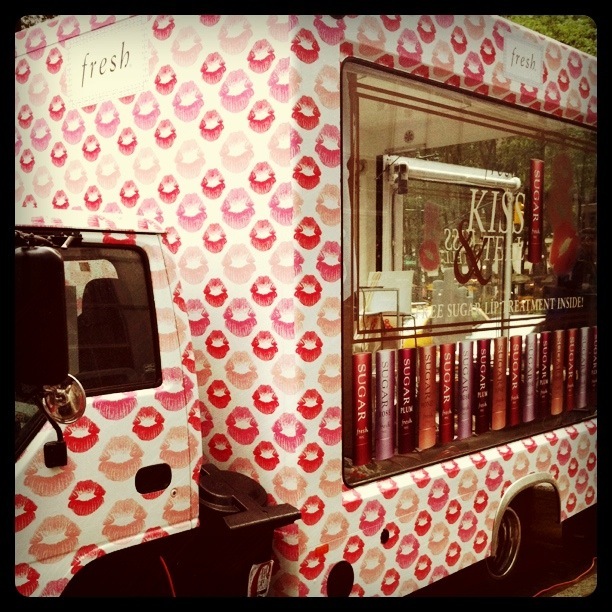 For those of us that have resided in cities where nothing cool ever happens, it was very exciting to discover on a blog that I followed that Fresh was giving out free lip balms in special trucks around New York. Where I happened to be on one of my days off. There was a truck waiting for me in Bryant Park. Those lip balms are usually stupid expensive, and it was about to be mine. For free. Yes, it's a lip balm---but look for the adventure in the mile ahead, people! So I stood and waited for my bus. And noticed it was about to pour great amounts of rain, and I stood patiently waiting for it without an umbrella. I waited for Brian the Bus Driver to stop and pick me up, only for the doors of the bus to open and reveal an impostor replacement that immediately noticed the shock and disappointment in my face. "WHATSA MATTA, YOU ON DA WRONG BUS?" The rain started falling in buckets and splashing all over the road and my dreams of free loot and lip treatments inside the magic truck. Once we were in the city, the bus driver actually stopped to let me jump off and buy a cheap umbrella so I wouldn't be in seahorse mode for the remainder of the day. Bryant Park, usually so happy and vibrant and full of life and activity was empty and full of puddles. I ran frantically through, looking for the truck as my umbrella flipped inside out and I tried not to cause a scene among the imaginary park inhabitants. I bounded across the street and was greeted by a man in a suit standing outside the back of the truck. Me: EXCUSE ME, ARE THERE ANY LIP BALMS LEFT? Fresh Man: We're closing this truck. We are going to try to open again later this evening at 114th and Broadway. I felt the rejection seep into my clothes like the rain that I'd met from my faulty new umbrella, and I walked to Chipotle and enjoyed some lunch by my lonesome as I felt my lips begin to chap. Later, in my desperate attempts to find a bathroom that I wouldn't contract anything from, I went into this bakery and had the world's best iced coffee with iced cubes that were shaped in a way that made me swoon. And, I had macarons. Mostly so I wouldn't feel bad about using their beautiful French restroom. 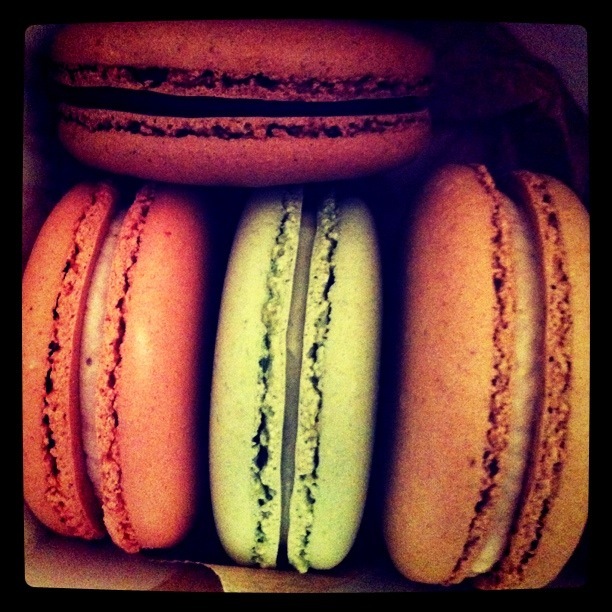 Plus, any reason to eat macarons is okay by me. My friends gently reminded me that after spending money for bus fare, and a new umbrella, the lip balm adventure wasn't actually free. But at least I tried. At least you got macaroons! Were you ever able to find another truck to get lip balm from? fran... i would have done it too... that lip balm is far superior to any others, but too expensive to justify buying. i hope you get it free soon! ahh i love fresh! i can't believe there are trucks somewhere giving out free fresh lip balm. JEALOUS. but in all seriousness - the lip balm is fantastic. i may or may not have forked over $22 to find that out. i'm a sucker for a good beauty product! hope you got a free one in the end! I loved reading your adventure here. You've got a great way of storytelling. :) I've never heard of Fresh before, but I gather that it must be some pretty awesome stuff! Sorry you missed out, though. That's a bummer, but at least you had a pretty grand adventure! Kel: I am glad you understand. I will probably cave eventually. Shannon: I'm so glad you understaaaand! I am on this Fresh kick lately. Sephora has this little boxed set of the lip balm and the sugar scrub! Plus when they put that "Allure Magazine Voted it the Best" sticker on there it makes it even worse for me. I envy your now luscious lips, fo sho. Kristin: Black currant?! Whaaaaaat? That sounds amazing. I bought a few more and they were lemon blueberry. They were beautiful. I am so glad you finally commented! I am honored that you're reading and enjoying everything. I can't wait to see the photos you took of Cam!